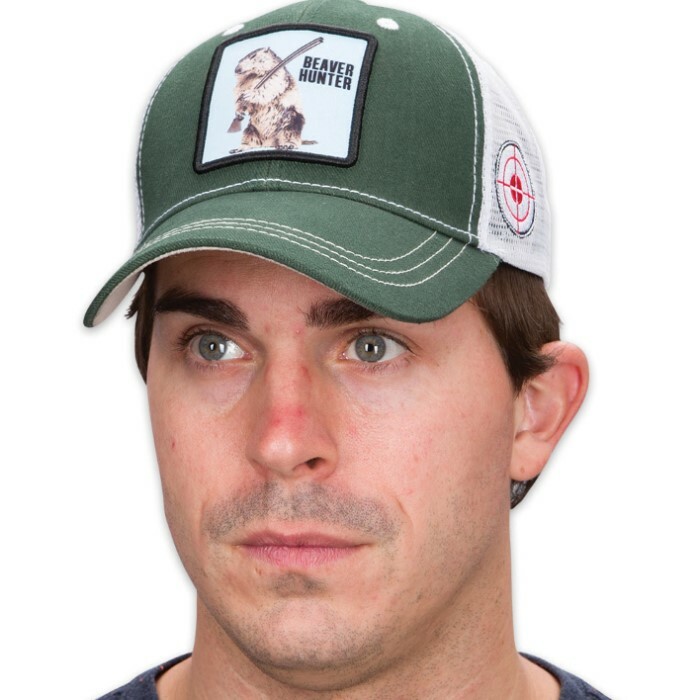 Double Down Beaver Hunter Trucker Cap - Dark Green Brushed Twill and Polyester Mesh | BUDK.com - Knives & Swords At The Lowest Prices! Who doesn’t love a cute, furry little beaver? Tell everyone you see that you’re on the prowl for one of these delightful critters (although a second beaver is always welcome...) with this hilarious Cotton Twill and Polyester Mesh Trucker-style Cap, designed in the USA by Double Down. The twisted double entendre is on full display here, as a printed sketch of a beaver with double-barreled shotgun slung over his shoulder takes front and center. “Beaver Hunter” is printed beside the beaver in simple, all-capital black letters. All of this is contained in a square field of sky blue surrounded by a black embroidered border. The brim and front third of the cap are dark green heavy brushed cotton twill, which joins the white polyester mesh back for a stylish retro blue-collar look. 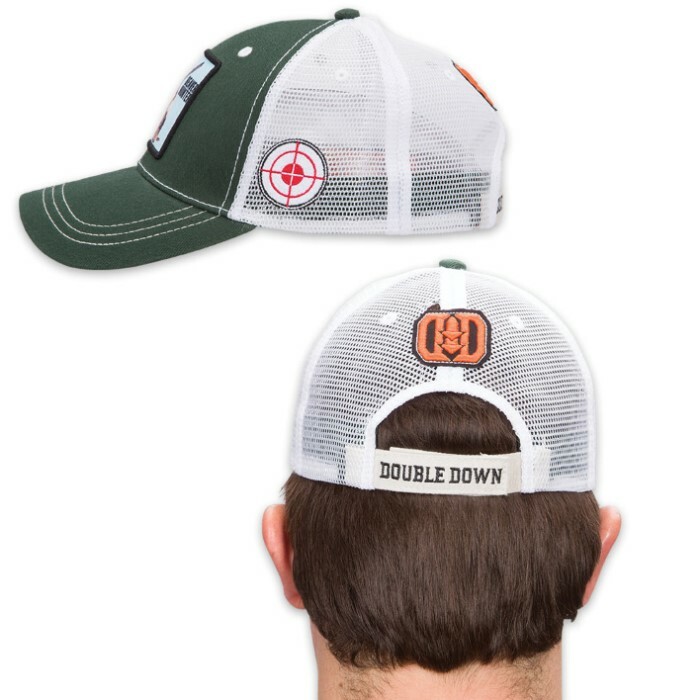 A round target with bullseye is embroidered on the left side; the orange-and-black Double Down logo is sewn onto the back above the adjustable Velcro back strap, which contains “Double Down” in all-capital black embroidered letters. 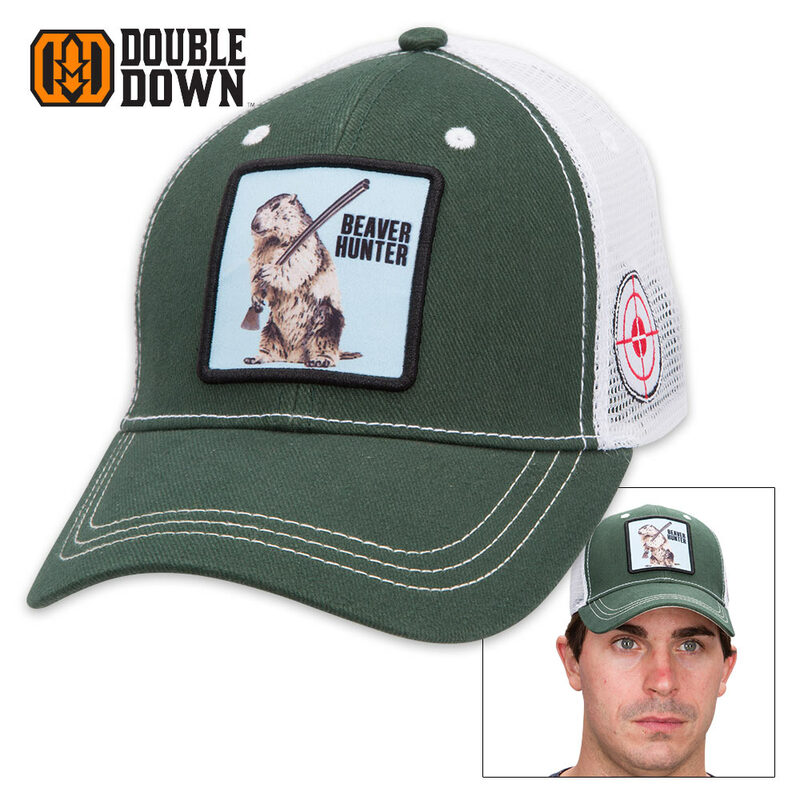 The cool, comfortable “Beaver Hunter” cap makes an amusing gift and is loads of fun to wear. The look on your friends’ faces when they see this cap for the first - and even second and third - time is sure to be priceless. One size fits most.